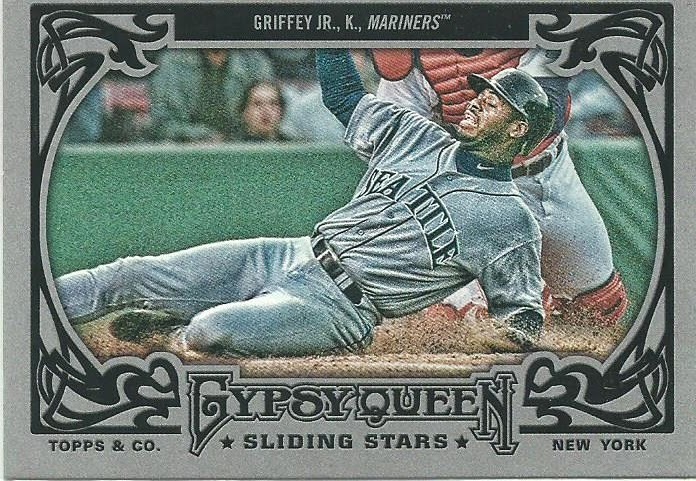 Today in continuation of my Griffey week I am going to just show some of my favorite cards that I have picked up this year. 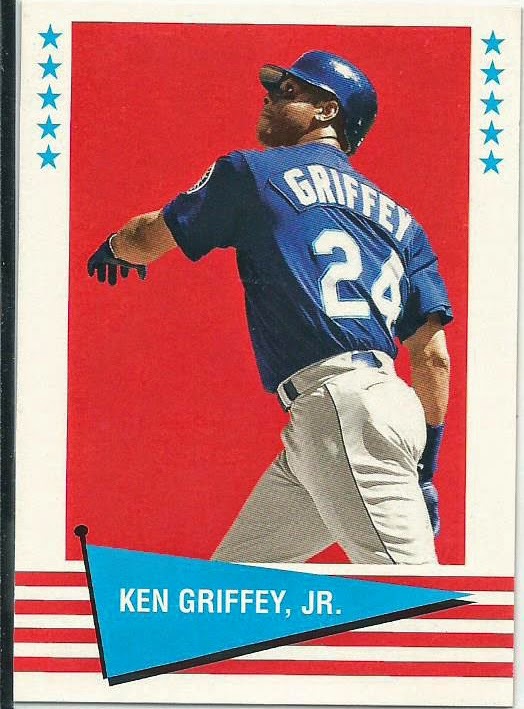 Tomorrow I will finish the week with my all-time favorite Griffey cards in my collection that I have picked up over the past 21 years. Selecting just 10 of my favorites from my 2014 pickups is difficult, I picked up some cornerstone collection cards like the 1993 & 1994 Finest along with some early Diamond Kings. 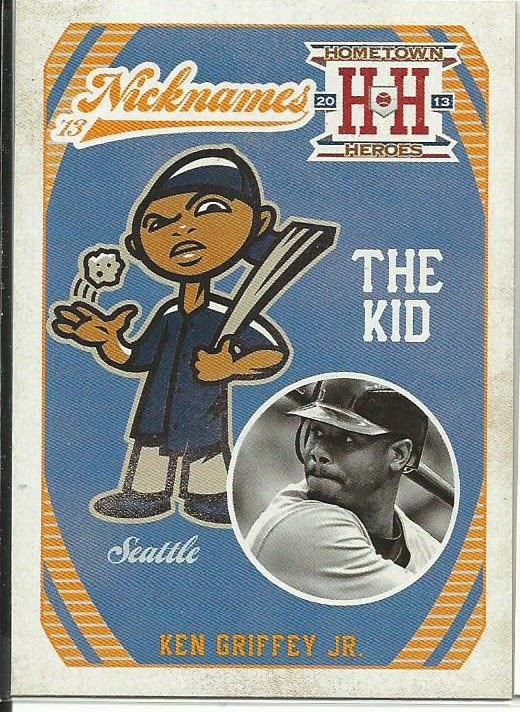 I exercised some Griffey ghosts along the way too. 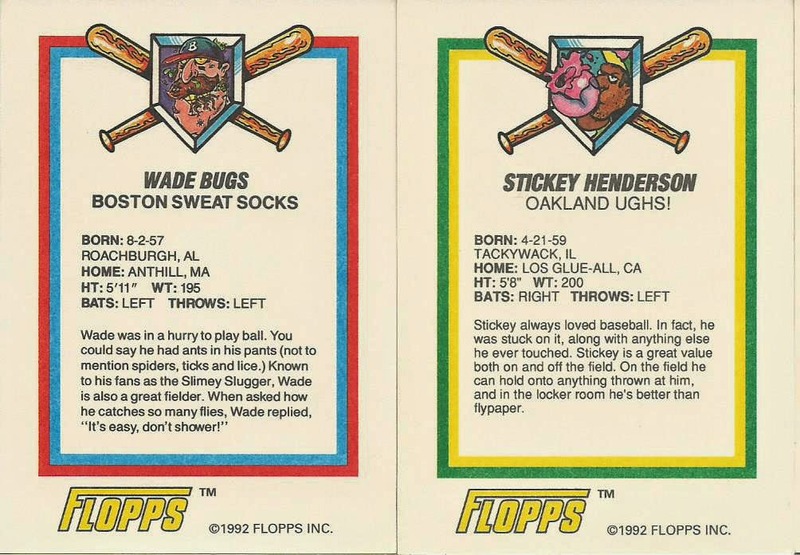 I think the most interesting card of this year’s pickups is the 1989 Upper Deck Griffey rookie error card with Chuck Crim and Thad Bosley double printed on the back. Believe it or not, this card cost me a little under $20 with shipping (just under my self-imposed max of $20), I am surprised to see them selling for around $50 now only 4 months later. 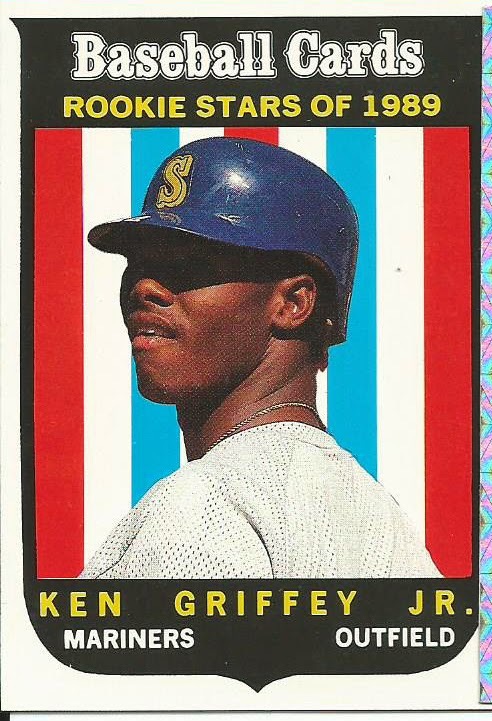 Yea, I slipped an eleventh card in, I couldn't force myself to cut out the 1994 Finest card even though it is similar to the 1993 Finest it is a cool card on it's own so it made the cut. Yesterday I posted my #200 Griffey card, today I am going to go back to the beginning with my first Griffey card. 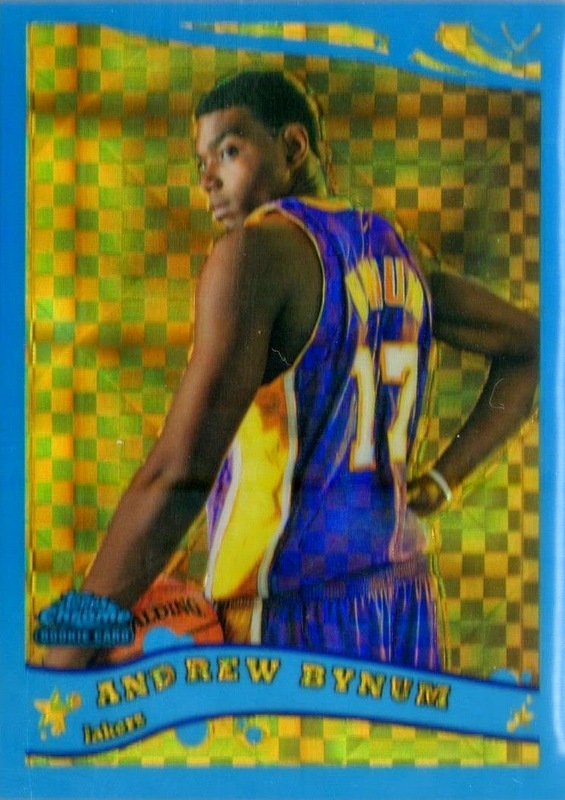 When I returned to collecting in 1992 I only was collecting basketball cards. 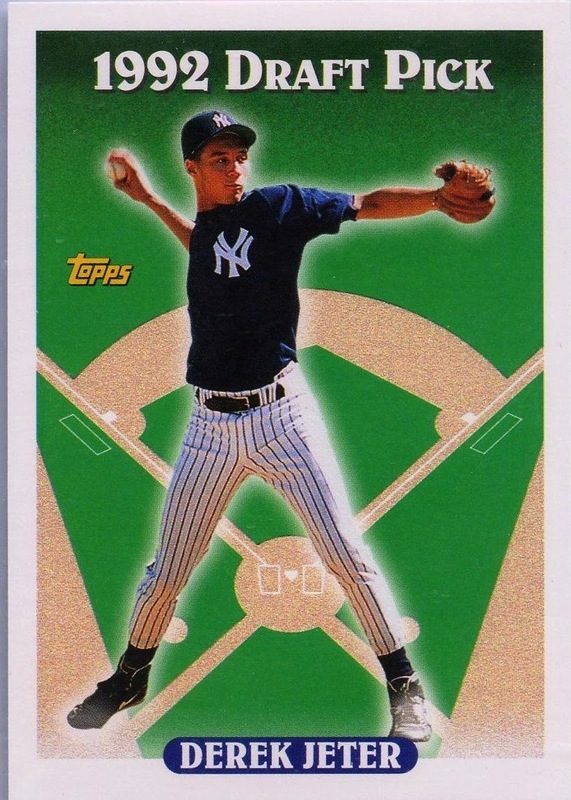 It was not until the 1993 MLB season opened when I decided to turn my attention in that direction and my favorite player’s rookie card was my obvious first “Big” purchase. 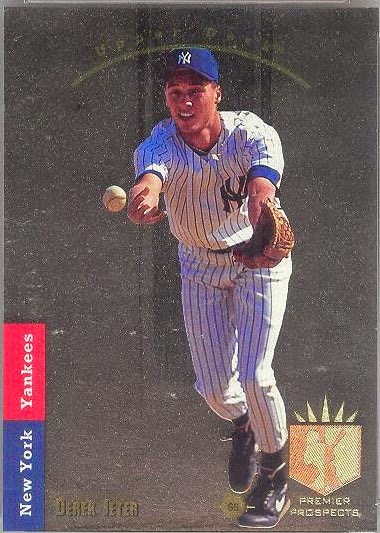 I picked up this card in early 1993 for $40, I know that you can find the same card today for about 10% of that price but I have never regretted paying that price for such an iconic card. 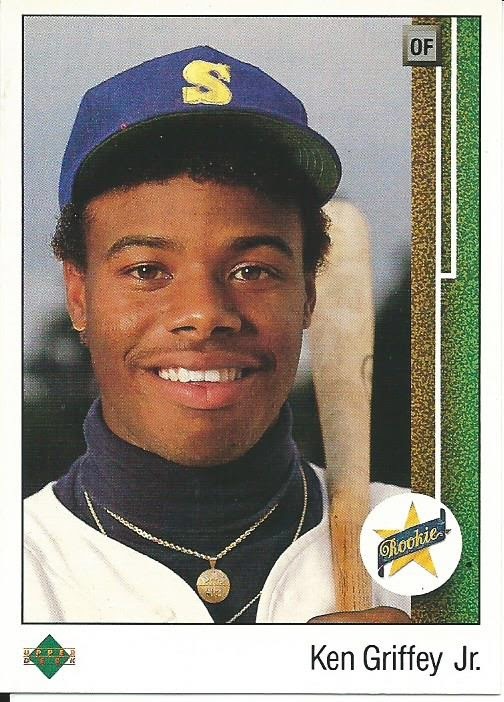 When it comes to collecting Griffey the obvious choice for the cornerstone of any collection is the 1989 Upper Deck Ken Griffey Jr. #1 rookie card. Upper Deck was unleashing the “premium” card to the market and what better way to celebrate this new era than using an amazing young prospect as your #1 card? An amazing young prospect who went on to play 22 years, knock 630 homeruns and an almost certain Hall of Fame first ballot selection in 2016. Monday was a pleasant day for me, I received a number of packages including plenty of Griffey cards and I finally hit 200 unique Griffey cards in my collection. Counting everything I received over the last two days I am at 211 Griffey cards and I still have a package coming from Justcommons so I am well on my way to 250 unique cards. 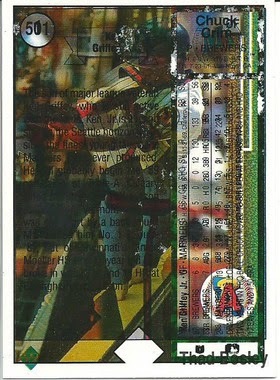 Card #200 is from 1995 and was inserted in to boxes of Post cereal. 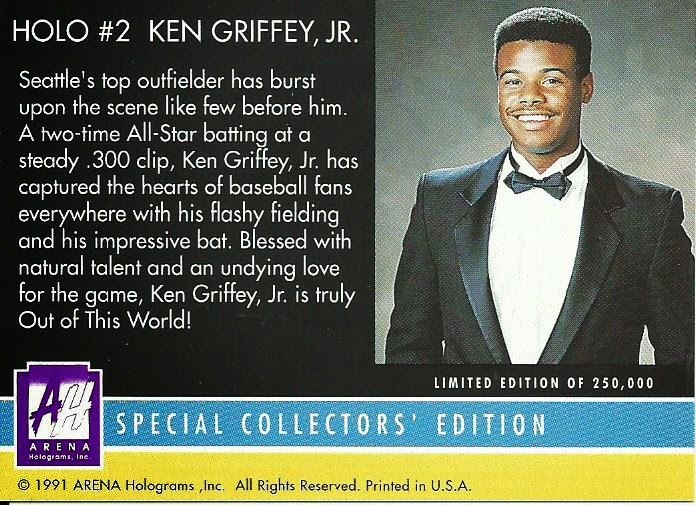 The card is a booklet style card that folds with the exterior showing a picture of Griffey on one side and the stats on the other side of the fold. 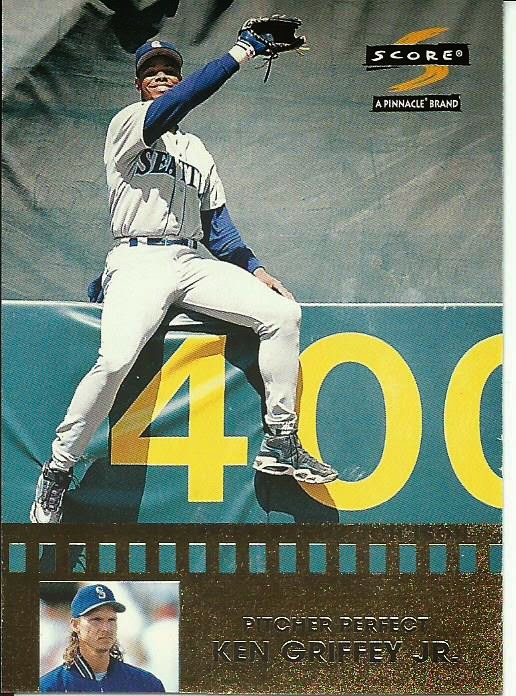 When you open up the booklet you get a shot of Griffey’s sweet swing, in what I imagine was a homerun by the way he is watching the ball sail out. I plan on displaying it opened, the interior panel is definitely display worthy. I tried figuring out which game this photo was taken from but Post didn’t have a MLB license so all images were airbrushed or blurred out. Doing my best Sherlock Holmes impression it appears to be a game against Cleveland with Tony Pena as catcher, Griffey at the plate and Jay Buhner on deck. 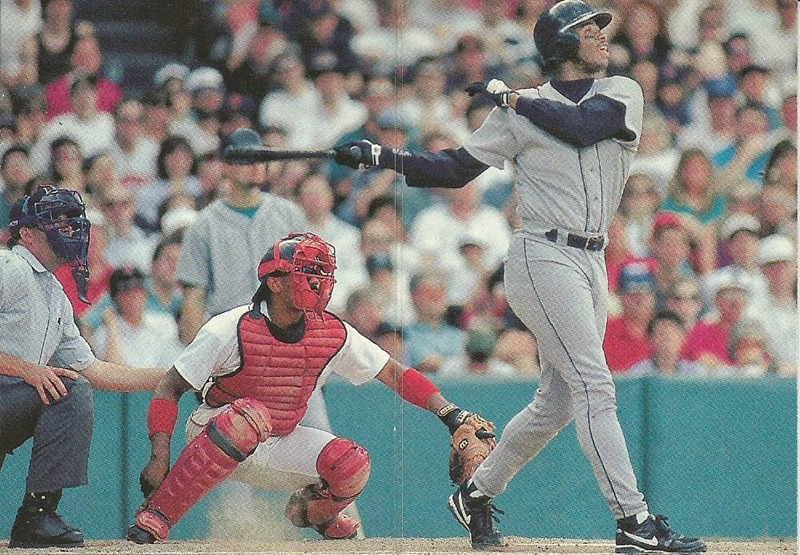 I checked out the lineups for the 14 games that the Mariners played Cleveland in 1994 and 1995 and there were no games with Griffey and Buhner batting in order with Pena playing catcher for Cleveland. I am stumped. 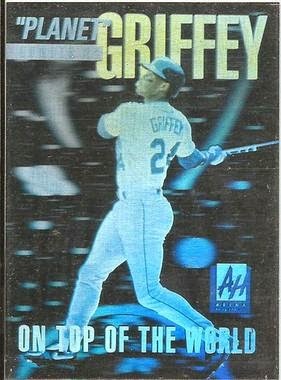 I start off my week of "200 Griffeys" with my best Griffey deal of the year. 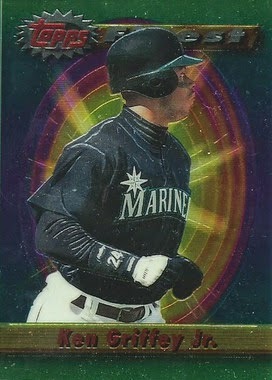 One card that I was hunting down is the 1991 Arena Hologram #2 card. There are actually two versions, the base version and an autographed version. I was just looking to add a base version, which normally sells for a dollar or two, so when I came across one listed with an opening bid of $14.99 I thought the seller was insane setting such a high price on a base card. I checked the auction to see what the seller’s feedback was, 100% with over 1,500 feedback. That is when I noticed there were two pictures in the description and the second picture was the autographed version. I read the description which said that the auction winner would receive both the base card and the autographed card so I ended up bidding. I won the election for $15.49 plus $3.00 shipping, only one other person bid too. This is a card that usually runs $60 or more so I am ecstatic about this pick up. This has got to be my best deal ever on eBay and all because the seller used an incomplete title which when matched up with what most people thought was an unbelievable opening price and people got scared away. In January, after I set my collecting goals for the year, I went through my collection to organize things. 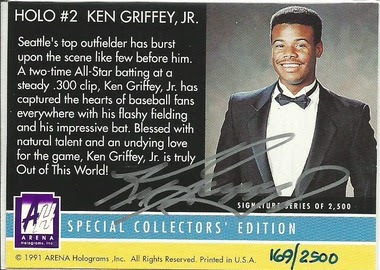 I came to realize that I only had 92 unique Ken Griffey Jr. cards, such a small number for a Griffey collector. 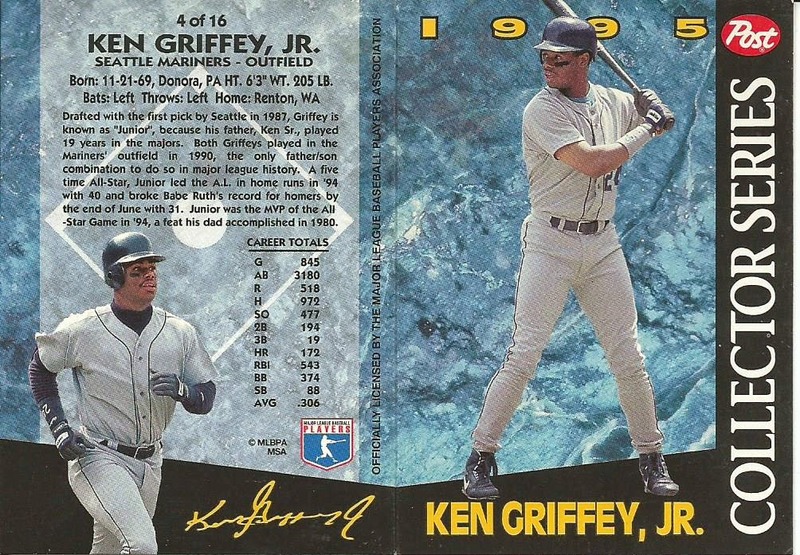 I decided that I will work to reach 200 unique Ken Griffey Jr. cards by the end of the year and hopefully exercise some of my Griffey ghosts. 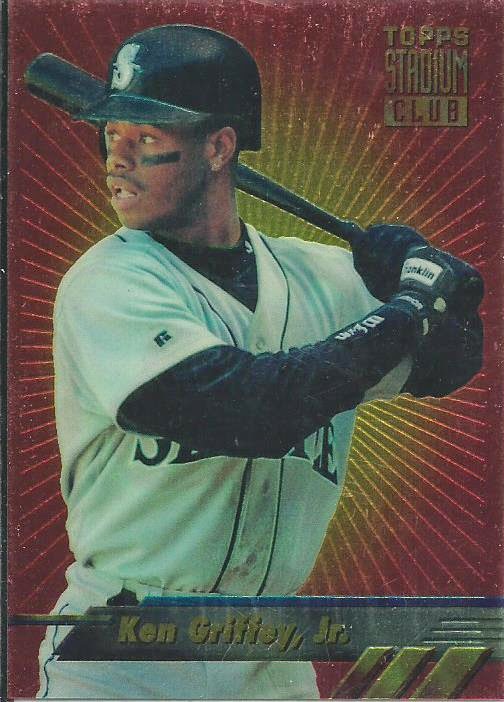 I started off the year by putting a list together of Ken Griffey Jr. cards that I want with the parameters that I will keep the list mainly base cards and base inserts and spend no more than $20 on an individual card. I have since added 97 unique cards to my collection and I have another 22 Griffey cards on the way so I will have reached my 200 card point by next week. My Wanted list still has another 123 cards (I do have to double check to ensure I am current) so I may be able to hit 250 by the end of the year. Once I have the list updated I will be adding a Trade Bait and Wanted section to my blog so I can hopefully add some cards through trade too. Next week I will post up Card #200 when it arrives. I am dealing with writer’s block so I am turning to another recent pick up, a Dawn Wells autograph. In May I finally got my hands on the Russell Johnson autograph that I had been watching so I turned my attention to adding a Dawn Wells autograph to my collection and I finally picked one up. 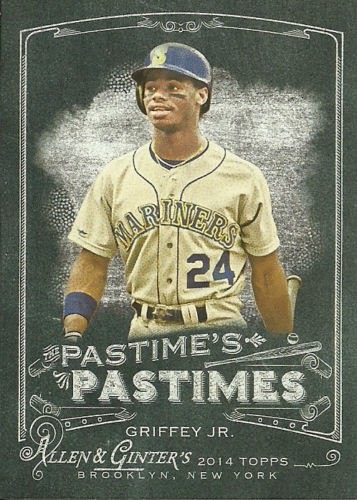 This one is from the 2013 Topps 75th Anniversary release. I am not really big on this card, the black and white re-print on the card just leaves too much open white space but it was within my price range, $9.24 shipped, so I picked it up to add to my Gilligan’s Island collection. 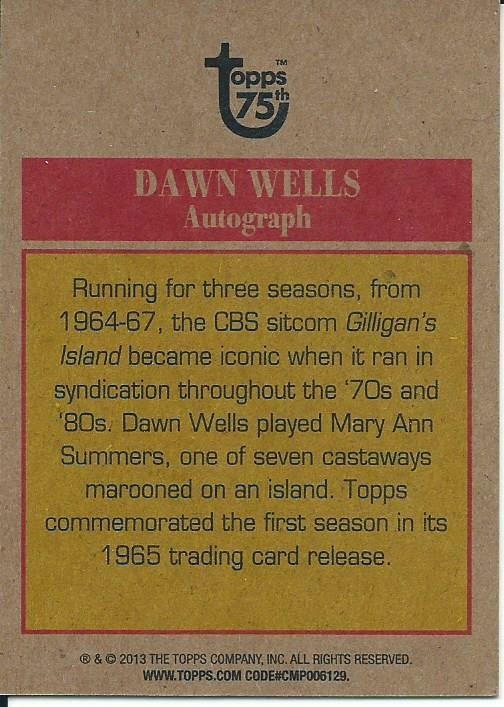 In 1997 Dart released a Gilligan’s Island set and I am planning on selecting a cool Dawn Wells and Tina Louis card from the set and send the cards to have them signed. I heard Dawn Wells is pretty good at signing for fans but Tina Louis is not but I am going to take my chances. 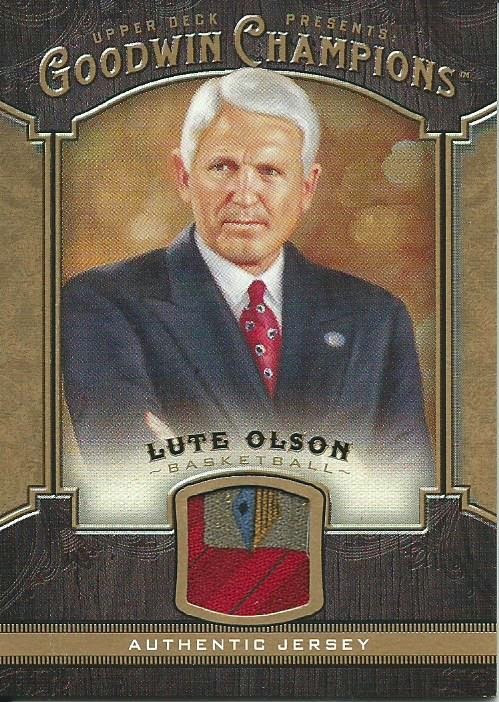 What University of Arizona collection is complete without a Lute Olson tie relic card? I picked this up a couple of days after 2014 Goodwin Champions went live, it cost me $5.74 shipped. Looking at the prices now for a multi-colored swatch like this and I got a deal. There is a patch version (#/50), which I think might be part of a jacket, but they are running closer to $15 shipped so I am holding out for a better price. 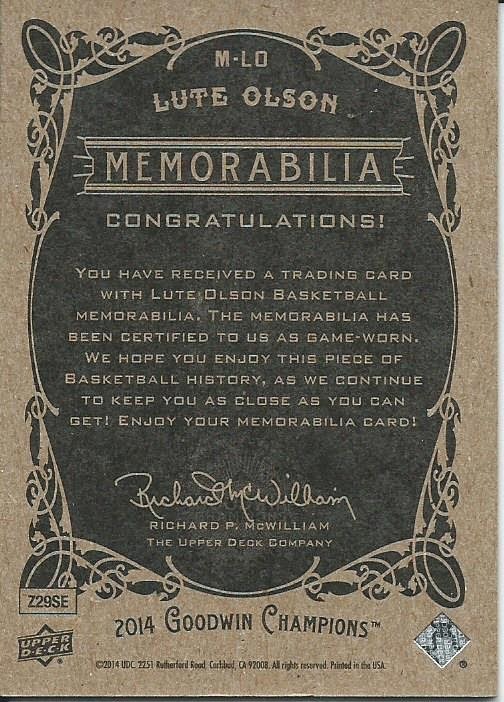 He has a couple of licensed autographs with Upper Deck and Leaf but this is Lute Olson’s first relic card so I am really happy that I have been able to add this to my personal collection. This month’s Art Gallery display is from the 2005 Dynamic Forces Army of Darkness release. 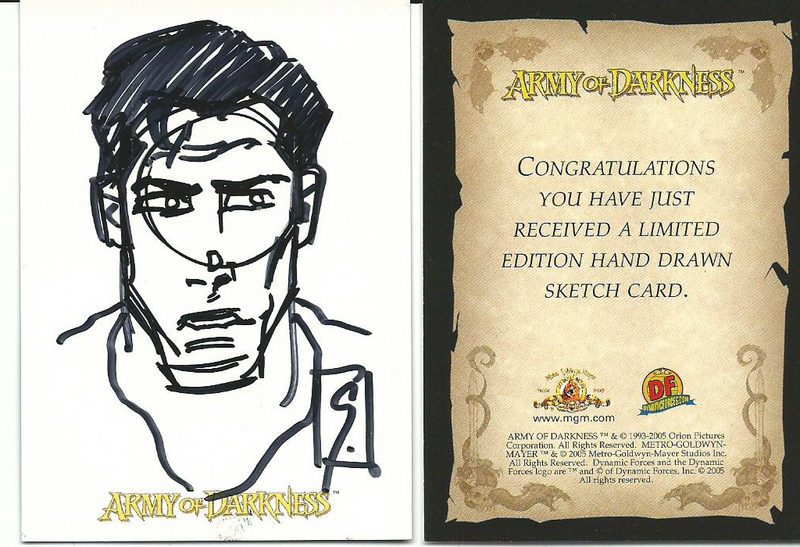 The card was done by the artist Filip Sablik and it is of Ash, the main character of the Evil Dead trilogy, played by cult actor Bruce Campbell. I love this movie, this was actually the first time I saw Bruce Campbell in a film and I was pulled in to his humor immediately. I have since built a library of Bruce Campbell DVDs including Evil Dead, Evil Dead II, The Army of Darkness, The Adventures of Brisco County Jr., Congo and Jack of All Trades. One of my favorite shows of all times remains The Adventures of Brisco County Jr. which premiered on Fox the same Friday night as another cult classic, The X Files. I am not sure why I remember that but it is still stuck in my brain 21 years later. The Army of Dakrness release was rather quiet, appearing 13 years after the movie was in theaters. The set contains 72 base cards, 6 glow-in-the dark cards along with some autographs (though Campbell was not included) and sketch cards. I picked up this card for two reasons, a) it was Ash and b) it was around $5 shipped. There are actually some really nice Ash sketch cards available but I try to stick with paying no more than $10 on a sketch card if I can help it. Filip Sablik is a comic book illustrator and does not often work with sketch cards, as a matter of fact the only sketch cards I can find of his are both from Dynamic Forces with Army of Darkness and 35 Years of Red Sonja. 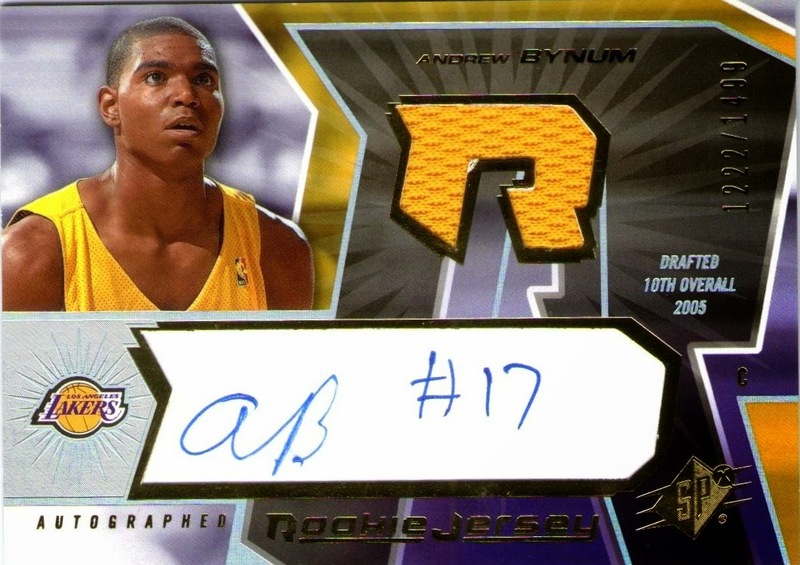 The other day I was reading a story about Andrew Bynum on ESPN describing how he plans on sitting out the 2014-15 season to have a procedure done on his knees. It surprises me how often his name shows up during the past couple of seasons during the trade and free agency periods. He seems like a hot commodity but he is always hurt. He played 82 games in his second season but has never played more than 65 games in any other season (averaging 52 games a year). He was an All-Star in 2011-12 but in the 2 years since he has been on 4 teams (76ers, Cavs, Bulls and Pacers) playing in only 26 games (24 w/ Cavs & 2 w/ Pacers) and now he is going to sit out another season. What surprises me even more is the prices that his cards are demanding. Many of his base cards and even his rookies and some relics are very reasonable in price but there are others that have his prices well off. Am I just blind to his value? Today I was looking forward to the Seattle Sounders-Tottenham Hotspur game but during halftime I switched over to the WNBA All-Star game and got sucked in and ended up recording the second half of the Sounders game so I could watch the basketball game. I rarely watch WNBA games, occasionally catching a Seattle Storm or Phoenix Mercury game from time to time, but this game was just captivating. It went back and forth before going in to overtime and an East win 125-124. What made this game so interesting was the way that second-year star Skylar Diggins and rookie Shoni Schimmel took over when it came down to crunch time, something LeBron James should watch. Schimmel put on a shooting clinic and won the All-Star MVP Award. 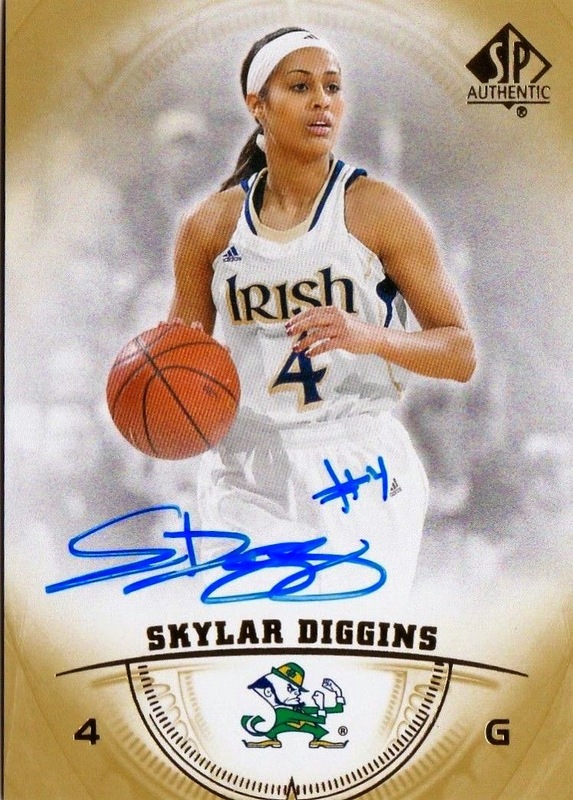 Skylar Diggins has been a star since her Notre Dame years and is quite well known whereas Schimmel, who was the #8 pick in April’s 2014 WNBA Draft, doesn’t even start on her own team. 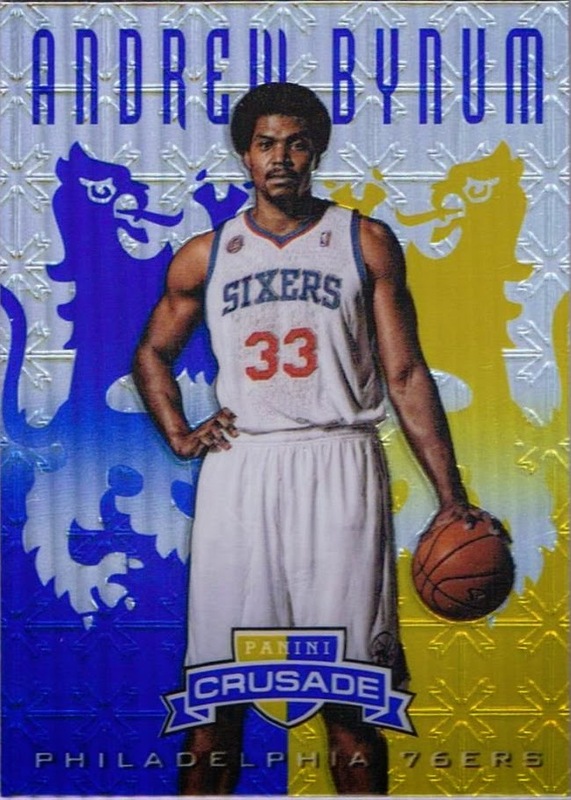 When it comes to WNBA cards collectors have one option, Rittenhouse. They have the WNBA license and they only release one set a year, which is very limited and sold as a complete set. 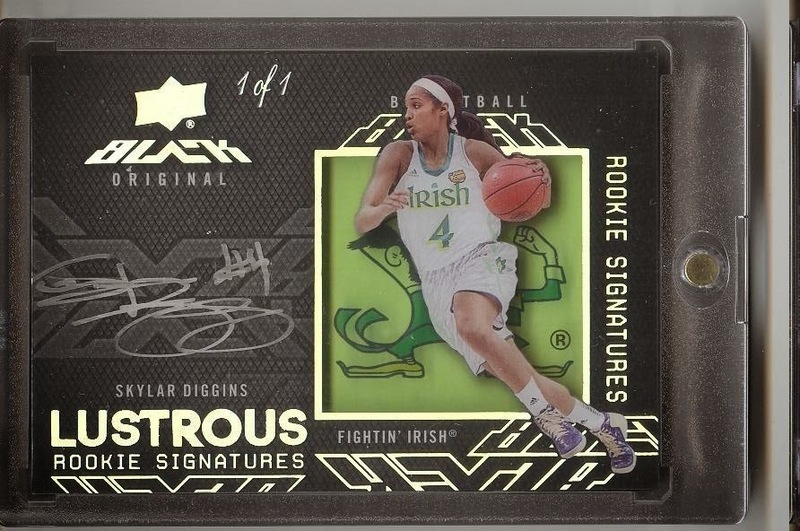 Skylar Diggins has plenty of options though, in addition to her 2013 Rittenhouse rookie card Upper Deck has included Diggins on a number of checklists include 2013-14 Fleer Retro, 2013-14 SP Authentic, 2013-14 UD Black and 2014 Goodwin Champions. Her 2013 Rittenhouse rookie will set you back $15 (or more) and her autographs range depending on availability with some in the $8-10 range while others are hitting the $100+ range. 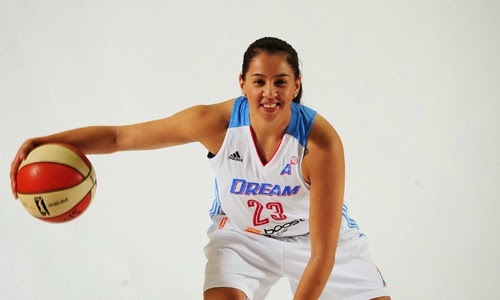 If you are a Showtime Schimmel fan you are out of luck, at least for now, her rookie card will not be available until the 2014 Rittenhouse WNBA set is released in two weeks. 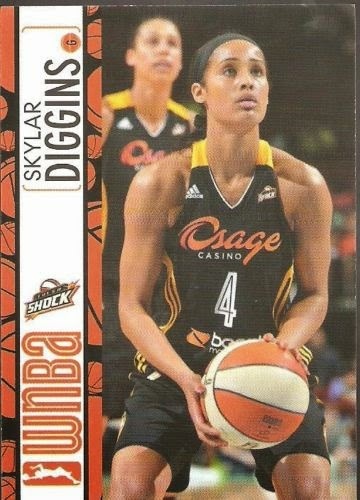 This will be the first time she appears on cardboard and with her play at the All-Star game there is a good chance that prices will be in the same range as Diggin’s 2013 rookie card. Last week I was watching some cards that I need for my 2014 Prizm World Cup set and I ended up bidding on two of the same cards without realizing it and ended up winning both auctions. As absent minded as I am it is a surprise that I have not done this before. 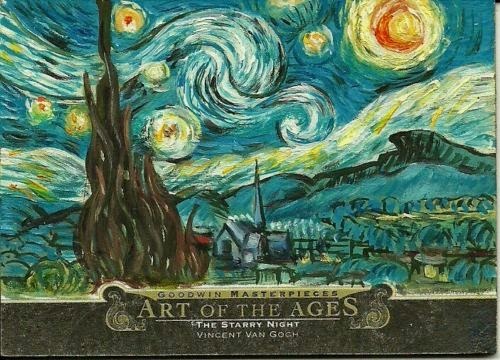 The other night after I posted the follow up of the release of the 2014 Goodwin Champions release the Art of the Ages “Starry Nights” painted card came up for auction with a $2999.99 BIN price. 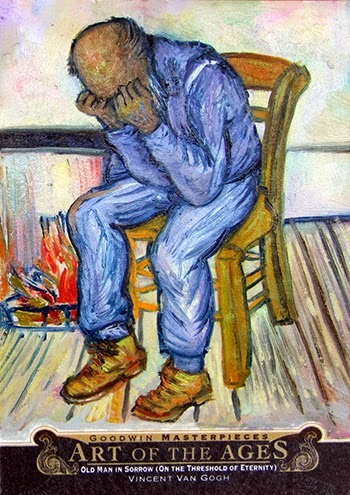 This is my favorite painting by far, even standing above my love of Munch’s “The Scream”. My first thought was that if I had $3000 I would buy this in a second but then I sat back and thought what a waste of money that would be. 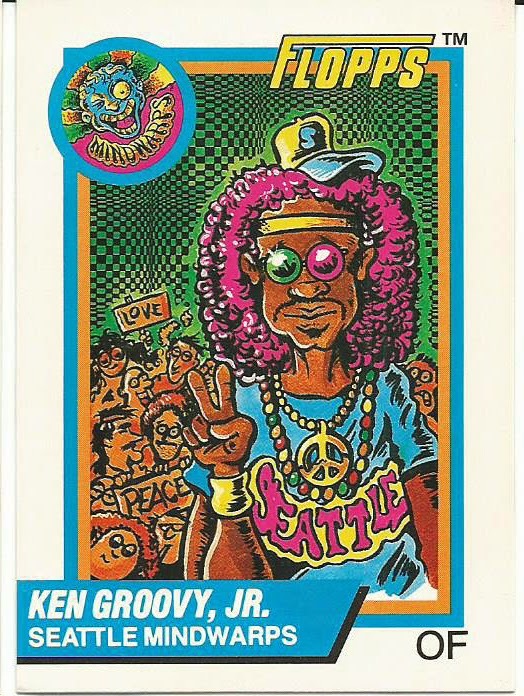 As much as I love this painting and would be in heaven if I owned this card the money would be better spent (if it was disposable cash) on building my personal collection. What is even more surprising is that this is not even the most expensive Art of the Ages painted card, that would go to Jim Mar’s interpretation of Raphael’s St.George at $20,000 BIN price. This just continues to support my idea that it is difficult to spend more than a hundred or so on a modern card. Possibly if it were in the $150-200 range I would consider but there is a difference between loving a card and adding it to your collection and loving a card and being realistic. The MLB All-Star game is about the best in baseball but tonight’s game was all about Derek Jeter. He played quite well and topped it off going 2-2 in his four innings which ending in a standing ovation and a tip of the hat from the Yankee’s captain. Jeter has been a class act his entire 20 year career, he set records, won awards and is a five-time World Series champion and there is no doubt that in 2019 he will be inducted in to the Hall of Fame on his first ballot. 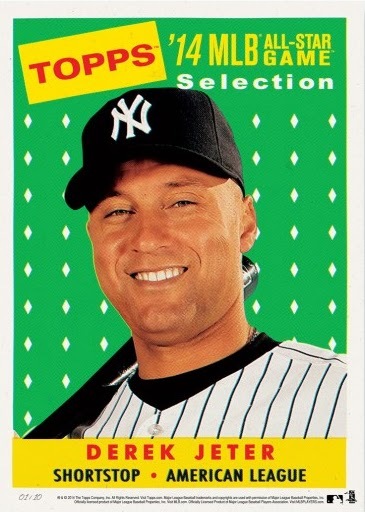 There are plenty of options when collecting Jeter cards, he came up during the junk wax era and has many cards worthy of any collection but I think the best place to start are his 1993 rookie cards. 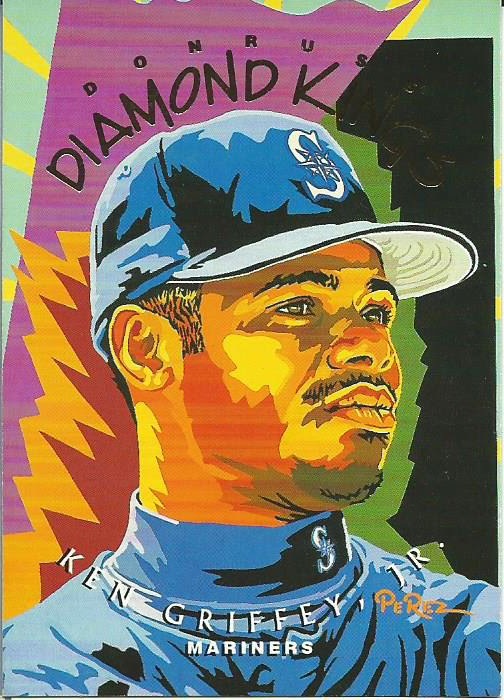 I have always been fond of the 1993 Topps #98 card, it just catches my eyes, but if you want to go iconic his 1993 SP #279 is the card to get. Last week 2014 UD Goodwin Champions was released and we are seeing some cool cards hitting the secondary market now. One thing can be said about the checklist, Upper Deck does their best to include a variety down the line from checklists to autographs and relics. 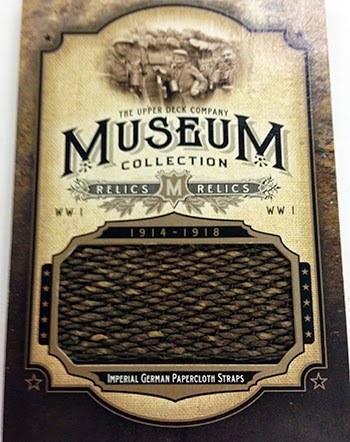 My favorites are the 3D Monster Cards, WWI Museum Collection relics and the Art for the Ages painted cards. They have all come out of the gates running with the Art cards demanding prices in the hundreds. 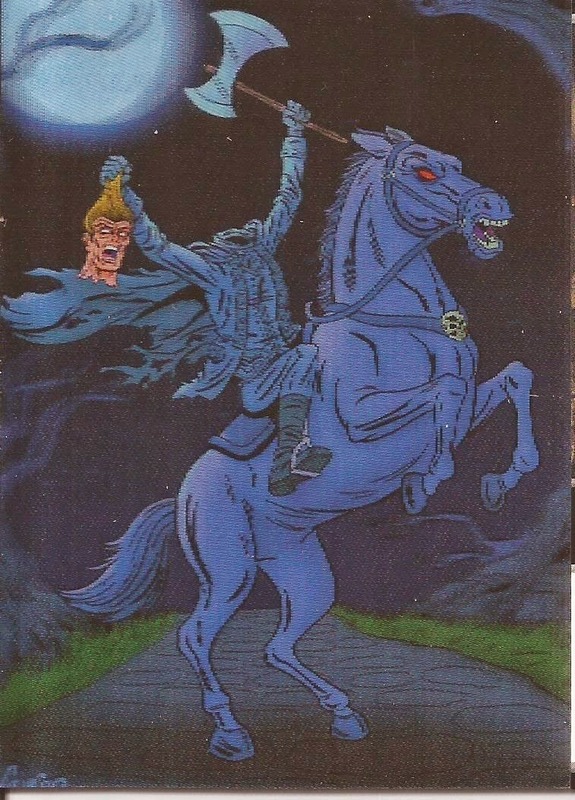 My favorite though, which I will be hunting down, are the Ghosts of WWI and the Headless Horseman. I would love to build this entire set eventually but these two are the first ones I plan on getting. The 60 card set was created by three different artists and they autographed 25 special versions of each of the 60 cards. With them being limited to #/25 I do not have a plan to hunt these down but if I do find some of the cards relatively priced I would be happy to add them to my collection. Many of the 3D Monster cards can be had for under $10 with the autographs running $15-20 with most cards. I am hoping that prices will drop as more product is broken. 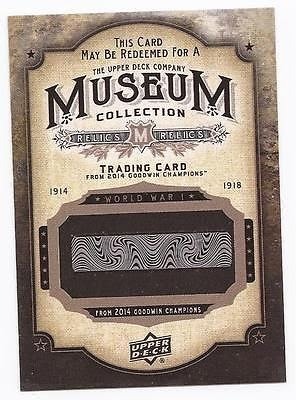 I am a WWI fanatic and with this being the 100th Anniversary of the beginning of the Great War we have seen some nice additions to various checklists but the Goodwin Champions Museum Collection set is by far the most comprehensive WWI addition in many years even topping the 2011 Topps Heritage WWI relics. 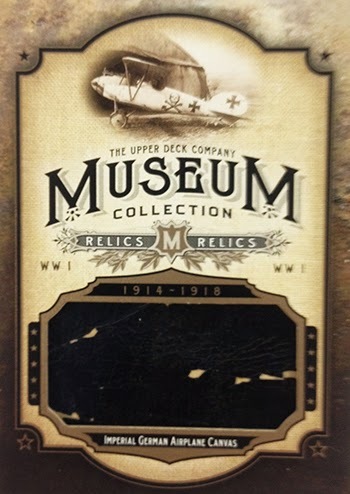 This set includes 41 different cards made up of various uniforms, helmet and hats relics but there are also dog tags, rank insignias, buckles, brooches and medals. I have had no luck procuring any of the Museum Collection relics from the past two releases (Civil War and Wild West) but I am intent on adding some of these beauties to my personal collection. Most of these are selling for $50 and up. Most of the uniform relics are probably going to settle in price to the $35-75 range as product is broken with the more unique items like the medal and broochs going for a signigicant amount more and possibly even closer to $750-1000 each. 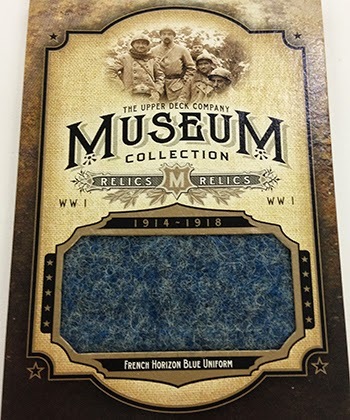 Easily my favorite insert in the Goodwin sets, topping even the WWI Museum Collection this year, is the Art of the Ages painted cards. Each year talented artists reproduce some of the world’s most famous and beloved paintings on cards and they are amazing. This year’s 300 cards include famous artists such as Monet, Picasso, Cezanne, Da Vinci and Rembrandt. This year also includes my three favorite painters; Edvard Munch, Vincent Van Gogh and Umberto Boccioni. 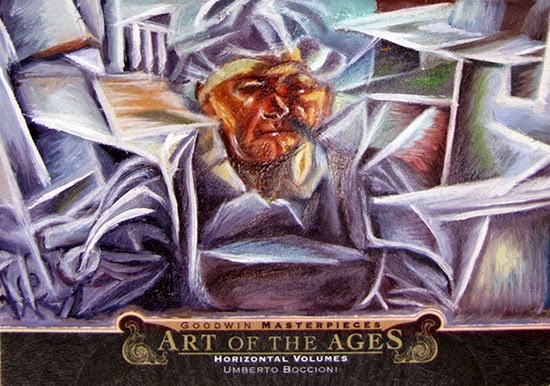 It was Boccioni’s work that drew me in to the Futurism movement and I would love to add any of his paintings to my collection, not that I can afford any of these Art cards. LeBron + Cleveland = Collectors $$$? 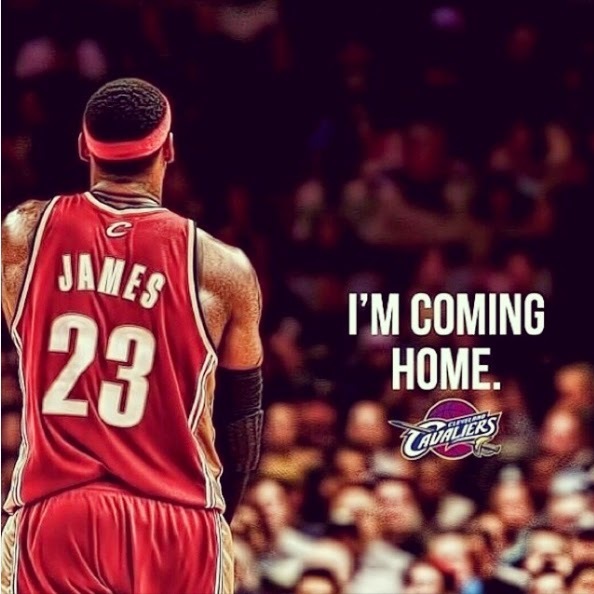 Will LeBron’s move back to Cleveland make big waves in the hobby? Sellers Location, Does It Matter? When looking to purchase a card there are a number of things that I review before I bid. Obviously the price is an important starting point but I check a collector’s feedback, shipping cost and the seller’s location. Normally I do not have a problem with a seller’s location as long as everything else seems right (feedback and shipping cost). In the last few months I have picked up items from England, Canada and Singapore but I have heard horror stories of cards never being received, seriously late, high shipping charges or mangled when received due to the long distance shipping. Will you skip purchasing a card/item if it is a foreign dealer? This month’s VCoM comes from National Chicle’s Sky Birds set, which were inserted in to packs of National Chicle Gum, and is designated as R136 1933 National Chicle Sky Birds. The company went bankrupt before the end of the 1930s but between 1933 and 1936 (I know, not a long time) they produced some of the most desired cards of the decade both in sports and non-sports releases. 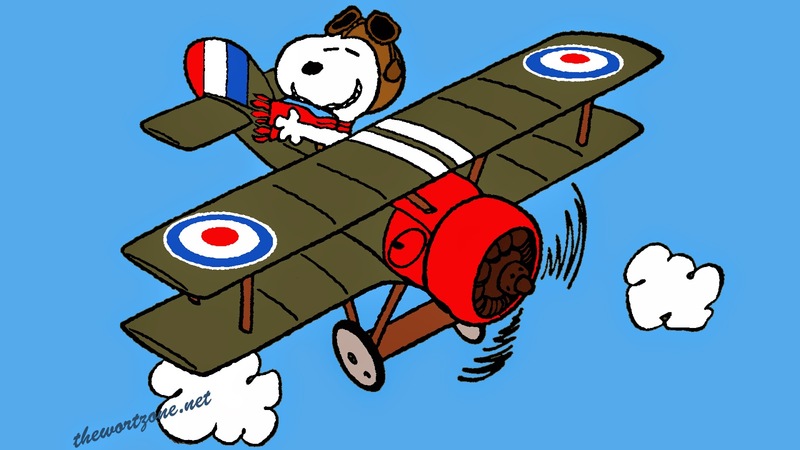 The Sky Birds set was brought back to life by Goudey Gum in 1941 but that set was built around the planes only, no pilots were included. The Sky Birds set was a multi-year continuous skip number set, the checklist states there are 144 cards in the release but there are actually only 108 cards. I am not sure if they did this intentionally or if they planned to release another year with the remaining 36 cards but canceled production once they started having money troubles. In 1933 cards 1-24 were released and in 1934 cards 25-108 were released. The set was designed around famous pilots plus 25 planes. Some of the pilots on the checklist; Eddie Rickenbacker (America’s first Ace in WWI), Orville Wright and Roy Brown (The man “officially” credited with shooting down the Red Baron though often debated) Some of the planes on the checklist; Sopwith Camel (the plane made famous by Snoopy in his battle with the Red Baron) and the Spirit of Saint Louis. I have been a World War I history buff for most of my life so I was drawn to the connection with this set. 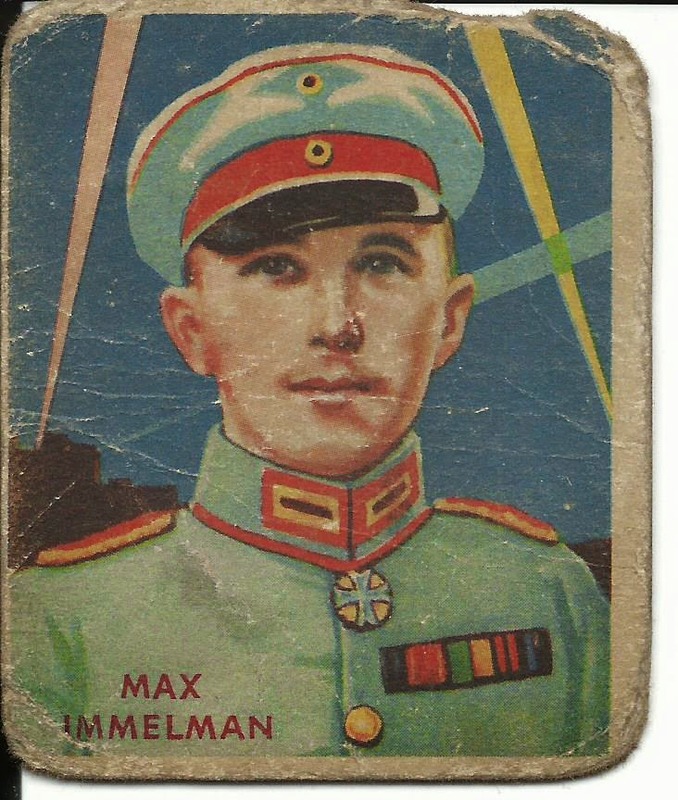 I picked up this Max Immelmann (It is misspelled on the card front but correctly on the card back) because of his historical significance. 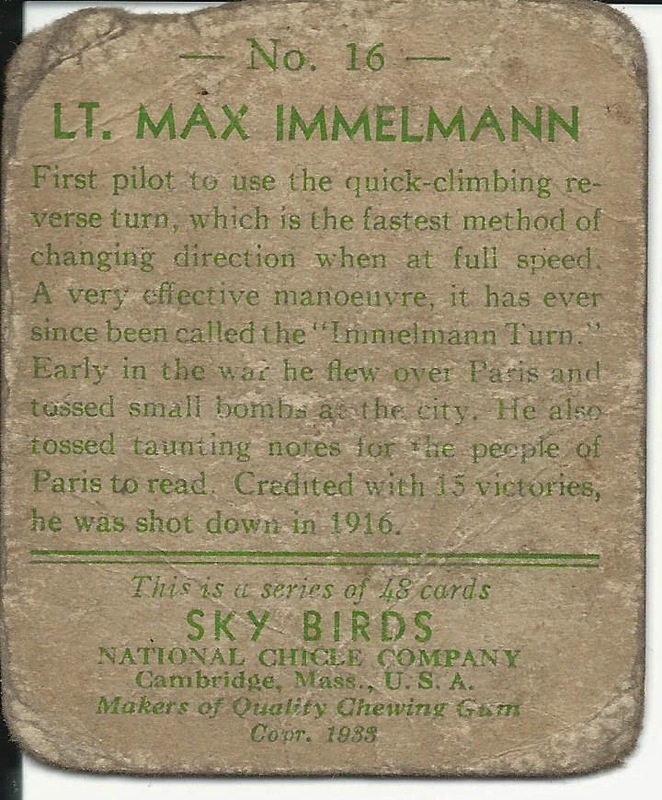 He is best known for the Immelmann Turn, a turning maneuver he designed so he could immediately change positions to attack another victim after shooting down an enemy aircraft. It is no longer used as a combat maneuver but it is still used by jet pilots today so they can make tactical turns at high speed. Additionally, Immelmann was Germany’s first ace and was credited with 15 victories before his death in June 1916. He was the first German pilot to ever be awarded the Pour le Merite, Germany’s highest military honor. The award has since been known as the Blue Max Cross in his honor. 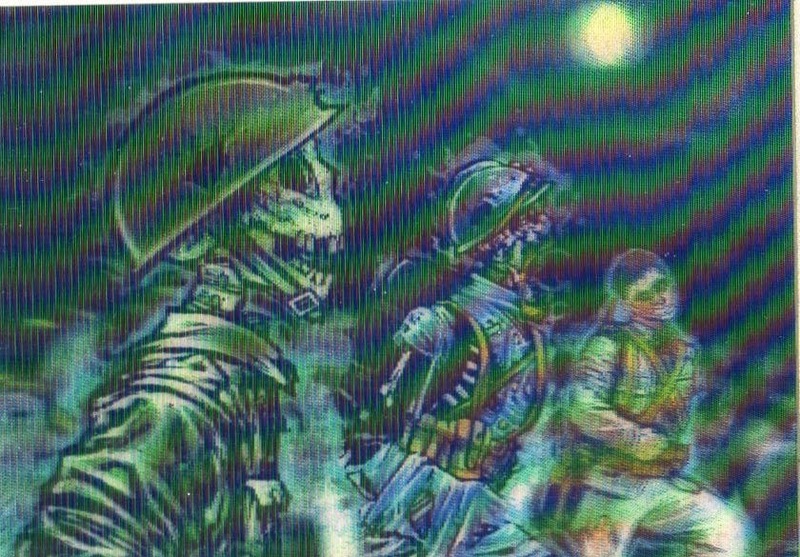 He is actually shown wearing the Blue Max Cross in this illustration. The card is seriously distressed, there are creases, bends and it is peeling around the edges. It actually looks like a small animal took a bite out of the top right corner. It is pure ugly, but a beautiful ugly. There is a personality to cards this damaged. After Germany’s 7-1 trouncing of Brazil I initially planned on posting another soccer themed post but when I went to my mailbox something special arrived that made me change my mind, I received my 1992 Pro Set Flopps 5-card promo set. 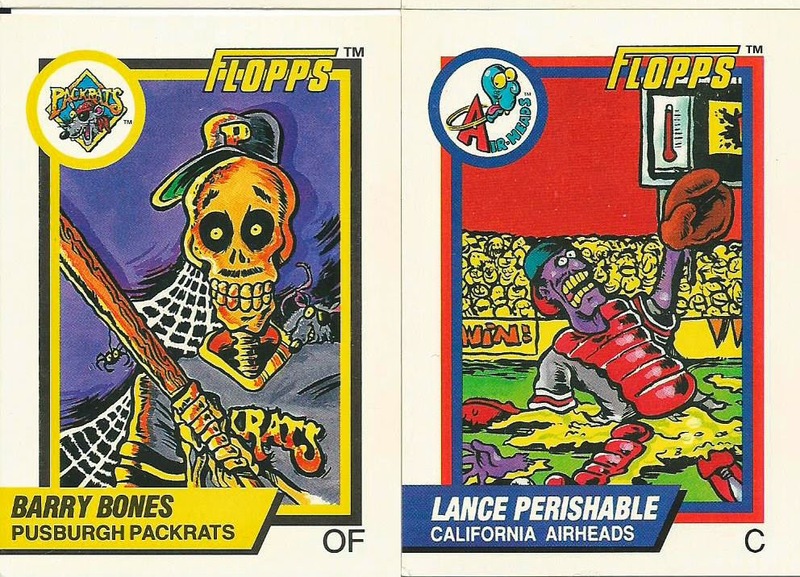 In the early 1990s sports cards were all over the place, companies were looking for any way to make money and that includes coming up with goofy and horrible sets. Pro Set was already producing football, hockey, golf and racing sets so they decided to take a step in to baseball by doing what is most logical… a parody set. 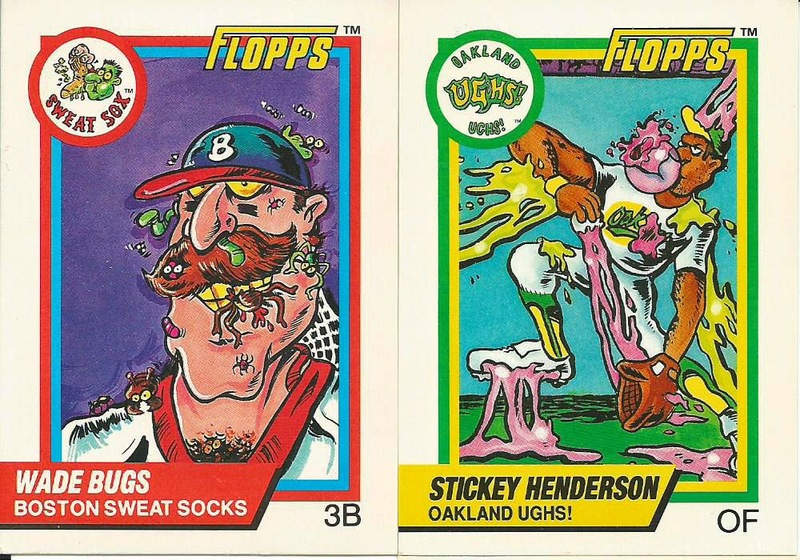 Their intention was to create a 66-card set (55 base cards, 10 scratch & sniff and 1 “collectible” card) using the big named players of the time and to kick things off they created a 5-card promo set to get interest built up. 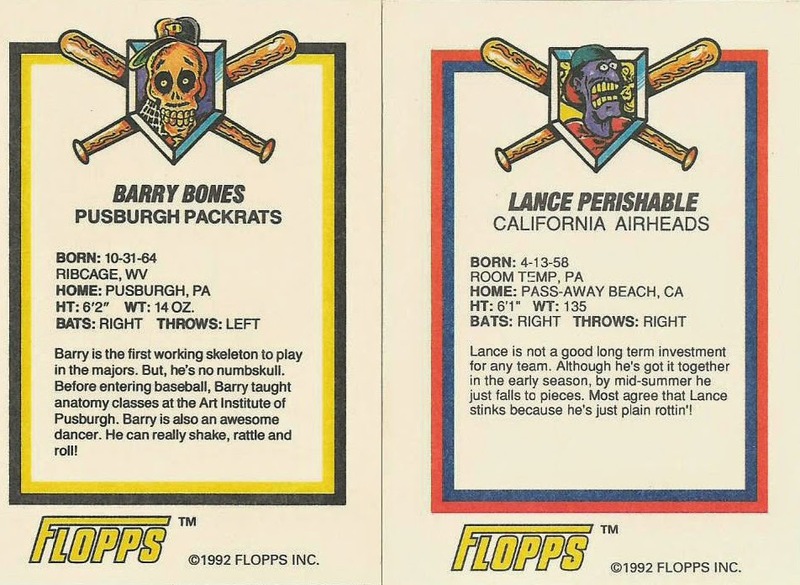 As expected the MLBPA did not appreciate the idea and things went legal, Pro Set ended up stopping production but not before the promo sets had already made it out to dealers. 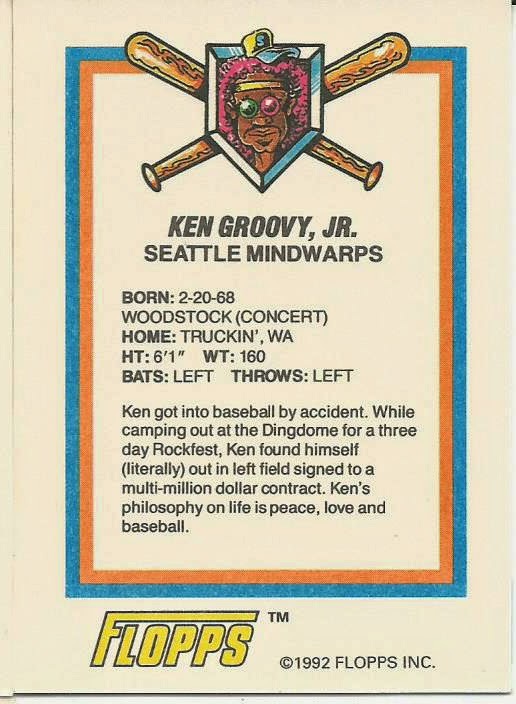 and the reason I bought the set Ken Groovy, Jr. 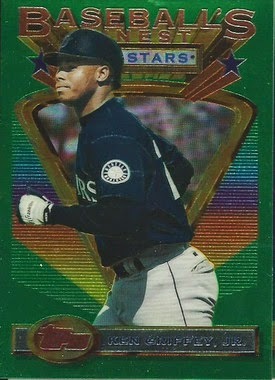 I never paid much attention to the set over the years but with my recent re-focusing on building my Griffey collection I have started searching out his cards. Individual cards run .99 cents up to a couple of dollars so when I found a sealed 5-card promo set for $1.99 shipped I jumped on it. While I was doing research on the set I came across a rumor that a couple of the base cards made it out to the public but I could not find any information about anyone every actually seeing one of these “back door” cards so I am going to write that off as just a legend.